More visibility, more business, less mystery. Say goodbye to geekspeak, and hello (or g'day) to Kiwi's version of Internet Marketing. Clean, simple, fresh - That's our Web Design motto, and it just so happens to be how we write content for websites as well. We'll help you create a site that holds people's eyeballs - because of what it says as well as how good it looks. This is the art and science of making your website visible to the millions of people who use search engines, the heart of Internet Marketing. Get found! Learn more about using Kiwi's SEO services to make your website bring in more traffic, and more business. Start tweeting, start building fans, start a conversation, and start seeing results. That's what Social Media for your business is about - reaching out with Web 2.0 technology to build those all important customer relationships. Kiwi can help you leverage Social Media to build customer relationships and drive sales for your business. Here's where we stand out from the crowd. We offer the best of both worlds: Powerful online marketing that integrates with effective offline marketing. Some of us have been in the marketing field for over 25 years - having written for Apple and IBM, amongst others. Others have never known a world without the Internet - so trust us when we say that we know the Internet (perhaps "shackled to it" would be more accurate). This combination allows us to deliver the best of both worlds. No matter what your challenges are, with our years of brick and mortar experience and our Internet Marketing know-how, your business doesn't confuse us. We promise not to confuse you. 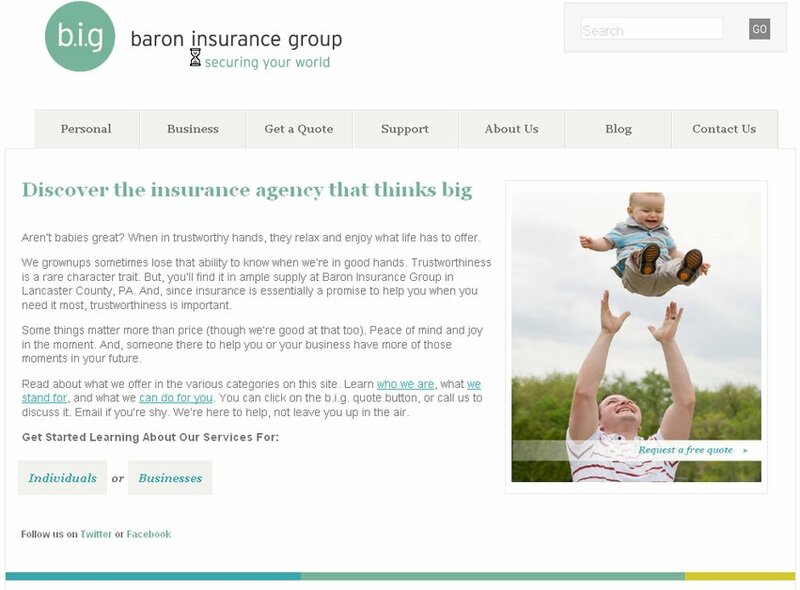 Home page for complete site redo, copywriting, and search engine optimization campaign for an independent insurance agency.